This one is simply wonderful. Story about undertakers who are also bus enthusiasts who bought MD138 and parked in on their drive much to the ire of their pompous neighbours in Chislehurst. Nice footage of the Metropolitan. By coincidence, the gentleman in the film works at Ensign and showed me this on his phone in the ouput on Saturday - he is very proud of this! 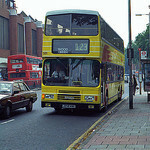 I remember MD138 in Chislehurst. Was there, so far as I can recall, for about a year. Eventually sold to Argos Bus in Hong Kong.